One of the questions coming into a new season is always how many viable 10.0 vaults a team is going to be able to put into its lineup. Aside from upgrading existing vaults, the main way to increase the number of 10.0 starts is with the addition of incoming freshmen. 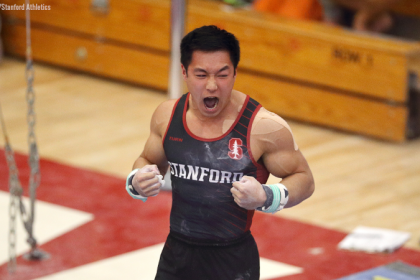 We took a look at these newcomers who boast big vaults, as well as a few other notables either because they’ve been seen training or could potentially upgrade to a 10.0 vault. In addition to those listed, many of the incoming retired elites (such as Bailie Key and Jazmyn Foberg) had Yurchenko double twists during their careers. However, most have not competed them for a significant period of time and therefore are not listed here as likely vaults for them as freshmen in NCAA—at least to start. Alabama gains an extremely solid Yurchenko one and a half from Graber in addition to several other 10.0 vaults already in its lineup. Dickson’s Yurchenko double is also very solid but perhaps has a few too many deductions in the form of knees and feet to slide into a lineup without some work first. Bellows’ high and clean Yurchenko one and a half will be a welcome addition to the Wildcats’ vault lineup, which last year had no 10.0 SVs. Much the same as Bellows above, Leonard-Baker’s Yurchenko one and a half comes into a lineup that last year struggled to post six viable vaults. While no recent video exists, she scored well in J.O. this year and should be expected to be a big contributor to the Sun Devil’s lineup. 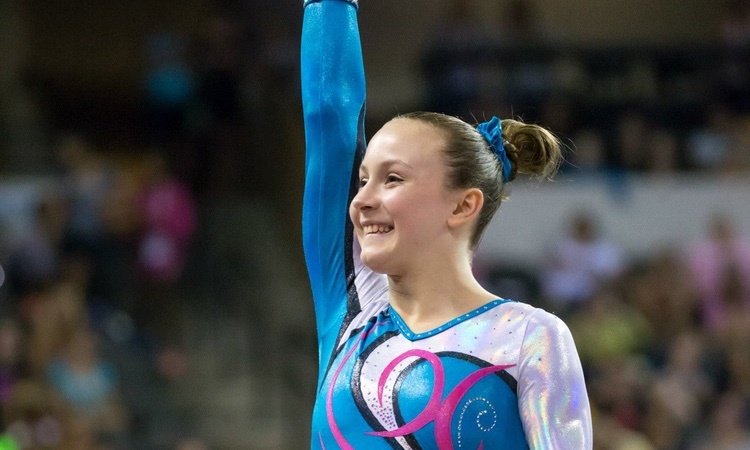 Brown brings a powerful Yurchenko one and a half and will pack an impressive one-two punch when combined with Maddie Karr’s next year. Steinmeyer has a solid and fairly consistent Yurchenko one and a half that will join ​Meaghan Sievers’ front handspring pike half as the second 10.0 start in the Cyclone’s vault lineup. Farley has scored as high as a 9.9 on this vault in J.O. but has had a few issues with consistency as it can lack block and height, resulting in a low landing. With a little more consistency on the post flight, this should make a strong addition to Michigan’s vault lineup. 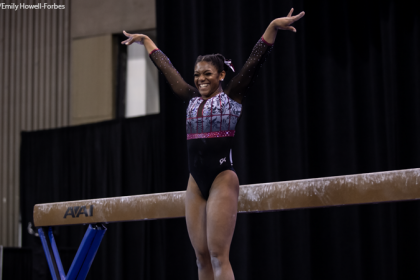 Townsend is an exception to the “they were elite, and we’re unsure what vault they’ll do in college” rule, as she vaulted a solid Yurchenko one and a half as a Canadian elite. She has competed this vault as recently as February this year at Elite Canada and seems that it wouldn’t take much for her to get it back if she ever lost it. Vault lineups can get rather repetitive, and we all appreciate a change from the usual Yurchenko variations. Maxim’s Tsuk has a little leg separation on the entry (as most vaults of this style do) but is otherwise clean and will be a welcome addition to Michigan State’s lineup. Another exception to the elite rule Ramler successfully competed her Yurchenko one and a half this year at J.O. nationals and it is expected that it will slide right in to fill the vault slot left by the graduation of Bailey Abernathy. Her vault is generally in the one-tenth-or-less deduction range on her landing with occasional small issues with her knees and feet during flight. Diggan has a solid Yurchenko one and a half that she competed successfully this season in JO and should make an excellent addition to a New Hampshire lineup that had no 10.0 SVs last year. Also notable is the fact she she competed a double twisting Yurchenko in JO in November of 2015. 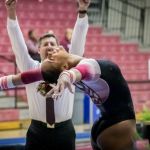 Bridgens’ solid and consistent Yurchenko one and a half should be expected to join Brianna Tsang’s in the lineup on a regular basis and is likely to score well for the Nittany Lions’. Training: Unknown. However, Lawson’s Yurchenko full has clean form in the air, as well as easy landings. This definitely has the potential to upgrade, either this year or in the near future. Training: Unknown, but this could be upgraded into a front handspring pike half.